Thank You 2018 Pick.Click.Give Donors! This week Four Valleys Community School received a check of $3900 from donations via Pick.Click.Give donors. We are grateful for the contributions of locals who value community education, and the programs that we offer locally. We exist today because of people like you who support us and choose to give a part of their Permanent Fund Dividend to help us keep on doing what we do best: providing enriching opportunities for the residents of Girdwood, Indian, Bird & Portage. Thank you for your support! To join in supporting FVCS through Pick.Click.Give, select us when you file for your 2019 Permanent Fund Dividend. It is an easy and great way to “share the wealth” through charitable giving, and your funds will stay right here in Girdwood to support our community education programs. Apply for your PFD from January 1 to March 31st, 2019 and select “Four Valleys Community School” in the drop down menu. To learn more, go to www.pickclickgive.org. 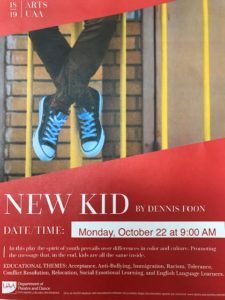 The Girdwood K-8 School had the University of Alaska come down to Girdwood to present a play that addresses acceptance, anti-bullying, immigration, racism, tolerance, conflict resolution, and social emotional learning. 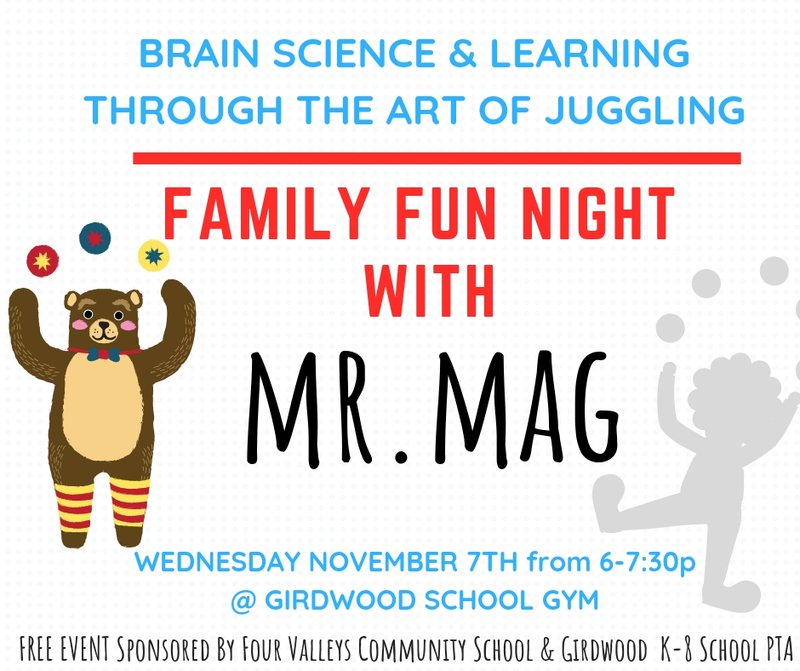 FVCS is proud to be a co-fund this event along with the Girdwood K-8 School and the Girdwood School PTA. Your donations help us to sponsor these important enriching events for our local school and youth. Thank you! 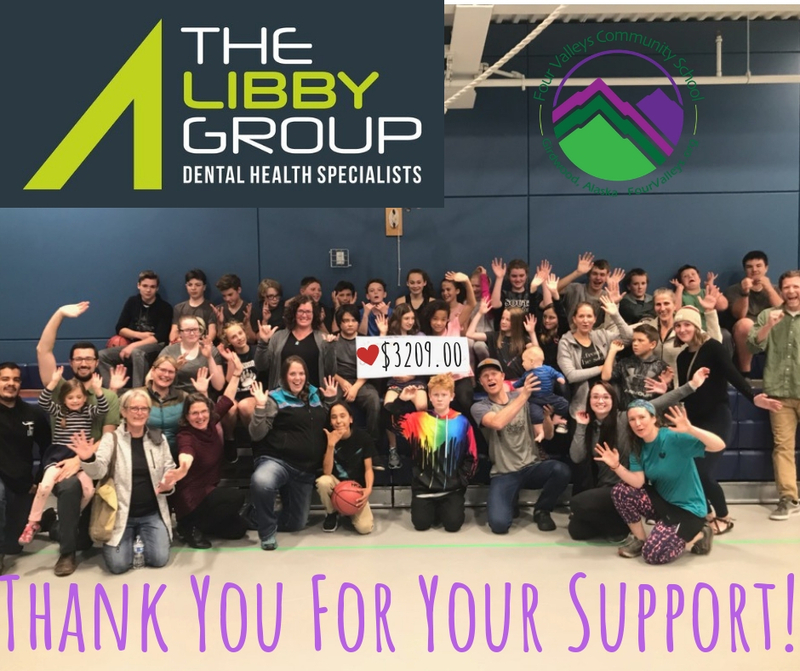 We want to say a big “Thank You” to our friends at The Libby Group who came down to Girdwood to support us with a donation and a friendly game of dodge ball with 20 middle-schoolers! The Libby Group is a dental office in Anchorage who believes in community outreach in support of healthy and active lifestyles. We are thrilled they chose Four Valleys Community School to support through a cash donation, and their contribution will be used to make some much needed equipment purchases for youth programs! An additional “Thank You” to Alex at Spoonline and Spike at Chair 5 for donating some lovely finger foods and pizza for our donor event. We really appreciate the local support we receive from engaged businesses like theirs! 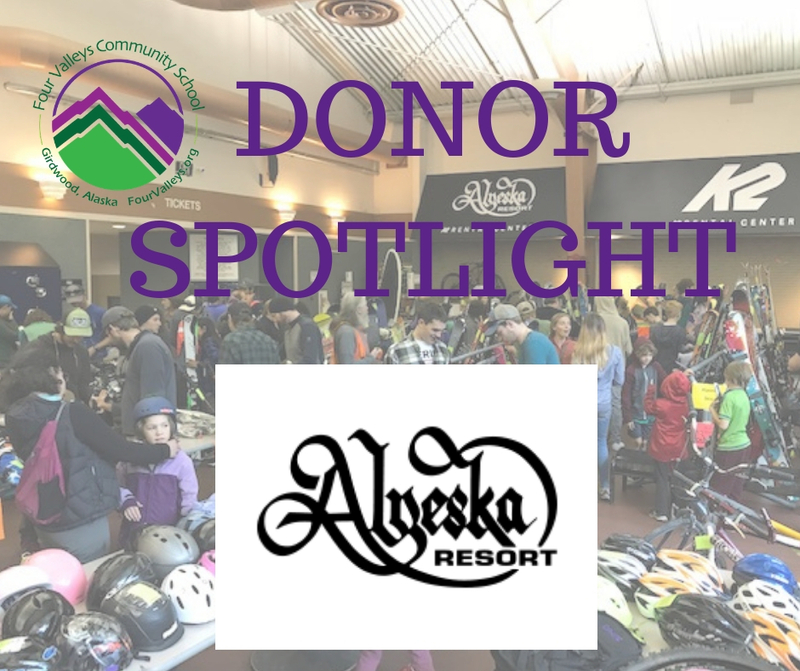 For our first ever Donor Spotlight, we want to highlight local business the Alyeska Resort. For years the Alyeska Resort has been hosting Four Valleys Community School each fall for our Ski & Sports Swap. We are grateful for the on-going support that allows us to make a difference in Girdwood, Bird, Indian and Portage, one community education program at a time. In addition to hosting the Ski & Sports Swap Alyeska Resort allows FVCS to teach local kids to swim in their swimming pool, sell our Alyeska Snow Classic tickets each spring at the Sitzmark and other Resort locations, hike and use Resort trails for our summer adventure camps, and was a sponsor of our Alyeska Junior Ski Patrol program for several years. We thank you for investing in community education, and laying a foundation of support that allows us to provide classes, events, programs and scholarships for our local community. 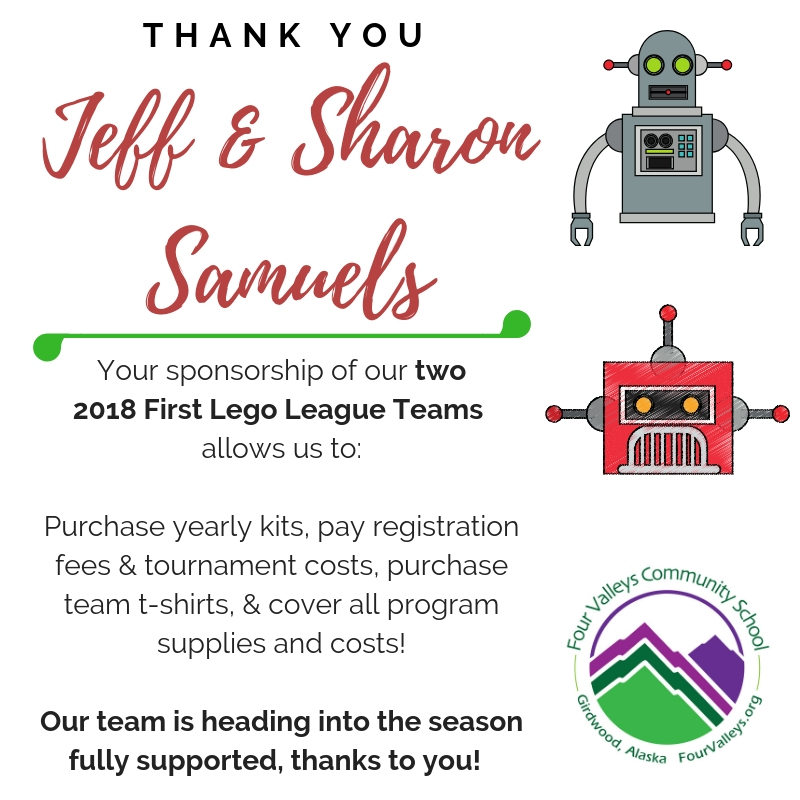 We are thrilled to have a Sponsor for our 2018-19 First LEGO League Teams! Thank you to Girdwood locals Jeff & Sharon Samuels for funding this opportunity for local kids! 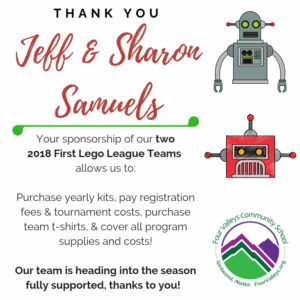 This Sponsorship of $1500 will allow us to purchase the LEGO kits, pay all registration fees and tournament costs, purchase team t-shirts, as well as cover all other program costs and supplies. Four Valleys Community School has other sponsorships available. You can sponsor our Nordic Ski Club, Cross Country Running program, and After School Arts program. All your donations stay local and are used to support programs for local kids. For more information, please contact cmcdermott@fourvalleys.org. Thank you again, Jeff and Sharon Samuels! 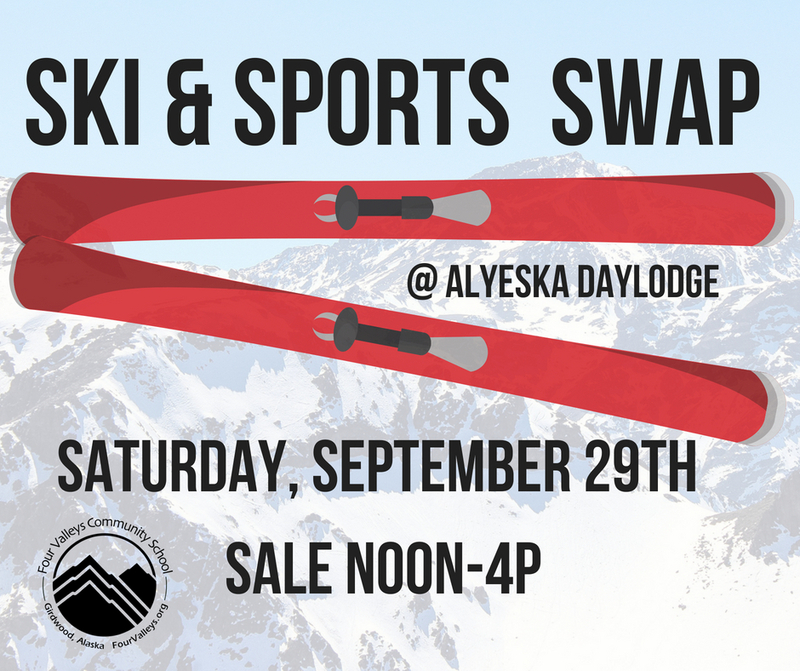 Ski & Sports Swap 2018: Get Your Gear Ready to Sell! Ski & Sports Swap 2018 will be held Saturday September 29th! Yellowing leaves and cool nights means that winter is heading quickly to Southcentral Alaska. Here in Girdwood one way we embrace the change of the seasons by sorting through last seasons sports equipment to make way for the next seasons gear. 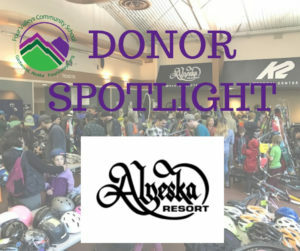 In a ski town this also means replacing used ski and boarding gear that has been outgrown or unused, and putting that equipment back on the local market via the FVCS Ski & Sports Swap held each fall at the Alyeska Daylodge. This event is a fundraiser for Four Valleys Community School, and a great annual community gathering. As you sort through your gear this fall and prepare for the winter, put some things aside for the Ski & Sports Swap. Control sheets and tags are available at the FVCS office now, and will be available at the Girdwood Post Office beginning September 14th. Want to sell gear, buy gear &/or volunteer? You can do it all! See details for each below. SELL YOUR GEAR and bring your high quality used sporting equipment to the Alyeska Daylodge from 9am-11am day of sale. 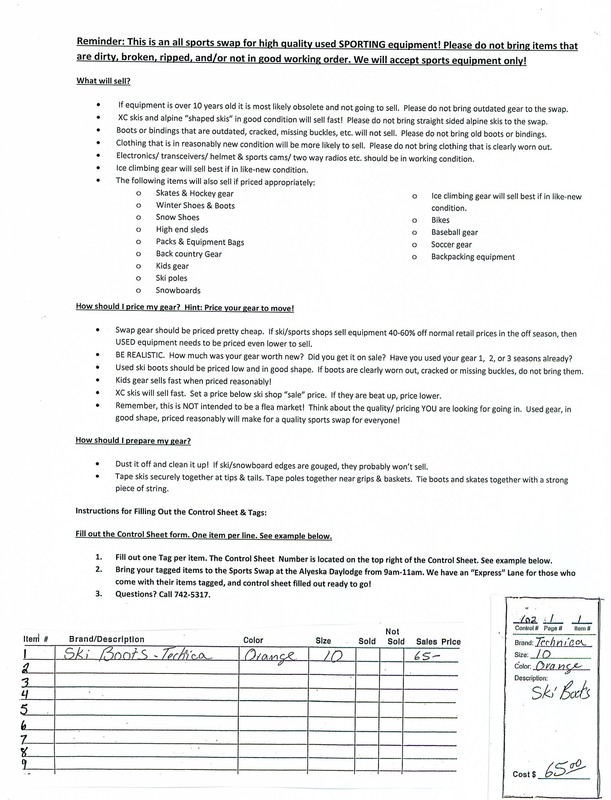 Be ahead of the game and tag and prepare your Control Sheet before Saturday 9/29. Tags and control sheets are available at the FVCS office NOW & the Girdwood Post Office beginning September 14th. Be sure to review our SKI SWAP TIPS. 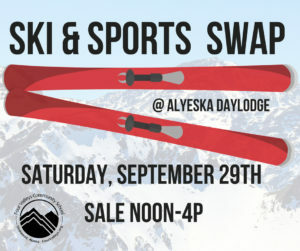 The Ski & Sports Swap is a fundraiser for FVCS and 25% of sale goes to help support our community education programs. BUY GEAR! The sale at the Alyeska Daylodge goes from 12-4p. Gear includes alpine ski & snowboard setups, bikes, Nordic ski gear, tennis rackets, baseball gloves, snowshoes, ice skates, and so much more. Our local ski shop Powderhound will be there with last years equipment at great prices. 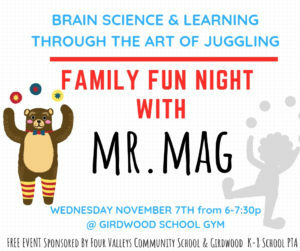 If it is a sport that can be done in Girdwood, there will be some gear for sale! Volunteers! We need YOU! Can you volunteer to work a few hours during the setup, the day of, or helping clean-up? Sign up here to volunteer! 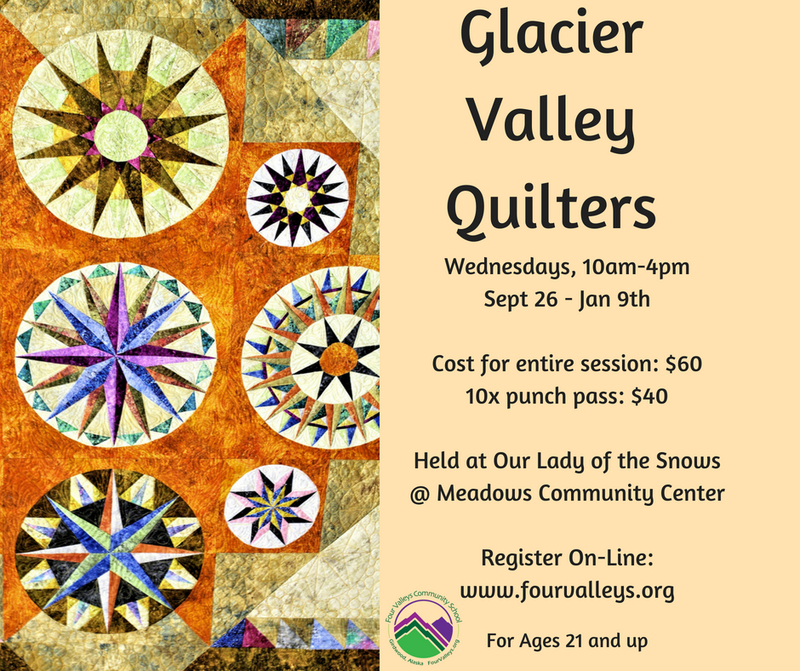 The Glacier Valley Quilters is a group that have been meeting for years to create both community projects and individual creations. If you are creatively incline, or want to improve your skills while also creating community connections this may be the group for you. Meets each Wednesday beginning September 26th until January 9th from 10a-4p. Come for the entire time, or as you can. 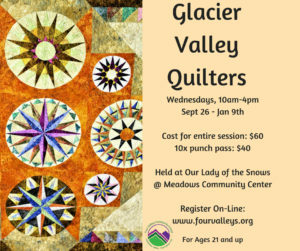 Register for Glacier Valley Quilters here, or register for a 10x Punch Pass instead. 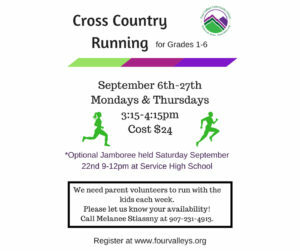 Our Cross Country Running program is a fitness program for our local kids to explore routes and trails around the Girdwood School, and enjoy the last weeks of warmer weather. Kids will experience running varying distances and challenges, and we invite everyone of 1st to 6th grade ages to participate. We believe strongly in providing a safe, yet exciting, venue for runners to enjoy nature, while also having the opportunity to reflect and challenge themselves. Hour long sessions will be held twice a week after school. Runners will be split up according to their speed. Runners are expected to attend all practices, wear proper running shoes plus hat and gloves if needed, and be prepared to run in the rain. Bring a change of clothes to change into afterwards, plus a water-bottle and snack to eat right after school. An optional Jamboree is held Saturday September 22nd at Service High School from 9am-Noon. 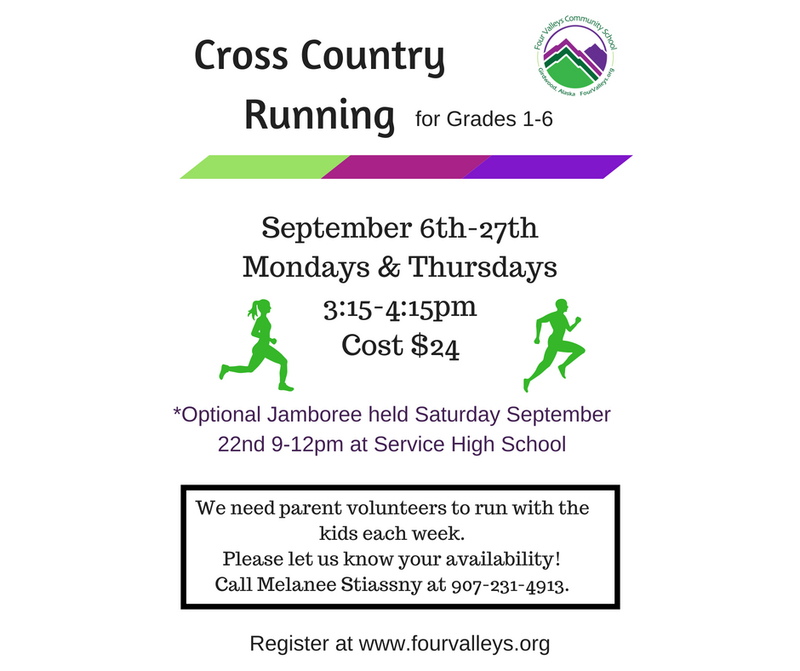 Click here to register for Cross Country Running for Grades 1-6th. Join Girdwood Fine Arts Camp for this special week long intensive focused on writing and drawing graphic novels and comics. For 4 hours a day students will work with experienced comic and writing professionals (class is 10a-4p daily with a one hour lunch). Students will be introduced to drawing techniques including character design, perspective and thumbnailing from media professionals. For ages 10-18. 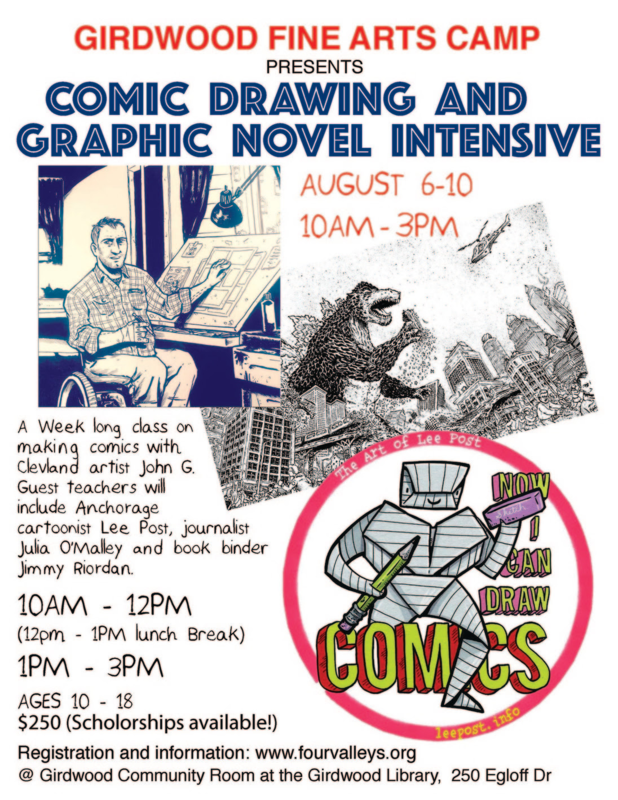 The class will be led by visiting artist John G. John, a Cleveland based cartoonist known for his work on the Lake Eerie Monster, will be accompanied by Anchorage based journalist Julia O’Malley and cartoonist Lee Post. Julia will teach writing alongside John, taking what she knows about breaking down complex stories and finding what is important and compelling, and translating it to plotting graphic fiction. Lee will share his unique style of character design and other drawing tricks, many of which he has honed through other teaching artist gigs.